Pennsylvania Homeschoolers is no longer offering ANY group testing services at all. We regret this decision, as I know many found this a terrific way to meet your testing requirements. Time constraints meant we had to give this up-- our PA Homeschoolers AP Online classes and our work with the Pennsylvania Homeschoolers Accreditation Agency programs is indeed taking all of our available time right now. Check with local homeschool co-op programs-- many of these programs have been offering group testing for their own students, and might be happy to 'add in' further area homeschoolers. Check out the Brewer Testing Service-- this is a homeschooling family offering varied tests for homeschoolers nationwide, including at least one *online* test. I've been hearing VERY positive things about this small company. Check out the Affordable Homeschool Testing Service LLC, which offers a new online test just recently OK'd by the PA Dept of Education-- the Measures of Academic Progress test. Check out the Bob Jones University Press Testing Service for Homeschoolers-- BJU has been offering testing for homeschoolers for over 30 years, and they have a range of options available. (here is their full PDF testing catalog). Check out Homeschool Testing Services (related to Classical Conversations)-- includes a network of local testing coordinators *and* options for online testing. Check out the Seton Testing Service (related to Seton Home Study)-- offers several tests, including online versions. Check out the Family Learning Organization (FLO) testing services-- this is a long-term testing provider, offering a range of different tests. Editor's Note from Susan Richman: Always great to hear about new offerings from the many wonderful Pennsylvania museums to help homeschoolers develop exciting learning programs! Hope many of you living in Western PA enjoy taking part in these great *field trip* outings in the Heinz History Center's new homeschool course! We are excited to announce our upcoming local history Homeschool Course, Adventures in Time and Place, at Meadowcroft Rockshelter and Historic Village, Fort Pitt Museum, and the Heinz History Center this fall. This is a new initiative for us, based on feedback from homeschooling families indicating a preference for course-style programs. Students from 4th to 6th grades will have the opportunity to visit all three of our sites to learn about the history of Western Pennsylvania from prehistory to the 20th century. Course sessions will include a range of hands-on and interactive experiences, investigations of objects, and archival material. Check the LINK to TESTING SERVICE and you'll see all info-- or just head to our online store to register and pay online. Hope to see many of you there! Remember-- testing is required under the Pennsylvania home education law in grades 3, 5 and 8. Testing is *optional* in other grade levels. Under the changes in the law made in fall of 2014, testing results need to be shown to the *evaluator*, as part of the portfolio for the year, but do NOT need to be turned in directly to the local school district. I feel that evaluators *should affirm* that testing was completed as required, and that these results were included in the portfolio that they reviewed. YES! Three November Testing Sites with the TerraNova Achievement Test-- just in WESTERN PA! Yes, finally here's an UPDATE on our Fall Testing Service! Thanks for your patience, everyone! We will *only* be testing in Western PA this fall-- our work with our AP Online classes is taking most of our 'homeschooling time' these days, and so we've needed to scale back our testing services. Looking for Math Enrichment or Math Tutoring Help??? A Great Online Resource for Homeschooling Families! I've been a teacher for 18 years, most of which has been spent teaching math at the lower school and middle school level. This year I decided to leave the classroom, and I'm offering a number of services around math education. A passion of mine has been working with stronger math students, both individually and in small groups, and helping them truly excel and reach their fullest potential. To this end I created a program geared specifically towards homeschooled students who are strong in math and want to go further. Definitely check out his websites to learn more at www.joshuaklur.com or at www.mathfreax.com. AND below is a thought-provoking blog article from Josh that shows his unique way of looking at students and math. Josh offers individual tutoring, standardized test-prep in mathematics, and his amazing 20-week online 'MathFreax Challenge' program. Great *blog* articles about math learningtoo at Josh's site-- very appropriate for homeschooling parents. "Meet the children wherever they are." As teachers, this is a foundational idea that we must never forget. We can plan the world’s greatest lessons, but if they aren’t tailored to the students we have, the lessons won’t be as successful as they could, and should, be. We must remember that we’re teaching specific students with a wide variety of strengths and challenges. Although this makes planning activities particularly challenging, we have to meet the individual needs of the students, not force them to conform to a one-size-fits-all curriculum. In math education there has been a long-standing debate, with well-intentioned educators and policy-makers taking diametrically opposed positions around how best to meet the needs of students. Some feel that it best meets the needs of students to group them with others of similar skills, abilities, and motivations (of course, how these things are measured is another hotbed of debate). These people argue for “regular” and “advanced” classes (and maybe some type of “remedial” classes as well). Others feel that it’s better to teach a wide range of students in the same place at the same time. We now have information all updated on our two PA Homeschoolers spring testing sites-- we'll be in Indiana PA on Thursday, March 26, 2015 and in the West Shore of Harrisburg on Wednesday, April 29, 2015. We'll be testing students in grades 3 and up. Messiah College, just 12 miles south of Harrisburg PA, off Route 15, is hosting special HOMESCHOOL DAYS at their Oakes Museum of Natural History on the campus. Classes involve hands-on lab experiences and active science enrichment learning. Discover the variety of ways animals in Pennsylvania survive the cold winter temperatures. Students will learn how animals interact and survive on the savanna in Africa. Using live animals and museum specimens, students will learn about this diverse group of animals. WASHINGTON, D.C. – U.S. Senator Pat Toomey (R-Pa.) wants to make it easier for all parents to save for their children’s education. HB 1013 passed the House today. It awaits Governor Corbett's signature. HB 1013 passed the Senate yesterday. It awaits a possible concurrence vote in the House today. Yesterday, the homeschool bill (House Bill 1013) passed the full PA senate by a vote of 37 to 11. (Click here to see who voted for it and who against.) It has passed four of the six hurdles. The House still has to "concur" with the language changes made by the Senate and Governor Corbett still needs to sign the bill. It is on today's PA House Calendar for a possible concurrence vote today. The PA House convenes at 11:00am for a rare Thursday session. (They usually are only in session Mondays through Wednesdays.) There is a lot on the House calendar today, so they may not get to HB 1013. 1. Parents would no longer need to turn in portfolios, just the evaluation letters. 2. Parent-issued diplomas would have to be recognized by the state. 3. The recognition of homeschool organization diplomas, now a matter of policy, will now be a matter of law. If it passes, you won't have to turn in your portfolios, just your evaluation letters next June. Yes, Pennsylvania Homeschoolers will indeed once again be offering our Fall Testing services, traveling across the state. This will be our *last* year to travel 'way East' for Fall Testing-- we will continue a few more years with testing in our region of Western PA. Still room for students in September SAT Essay preparation course online through PA Homeschoolers! There is still room for more students in my Fall SAT Essay Preparation class. If your student will be taking the SAT this year or in 2015, he or she will be required to write an essay in 25 minutes on a topic given by the College Board. This can be very intimidating to homeschool students, especially those who have already taken the SAT and scored poorly on the writing section. Helping students learn what to expect is a significant benefit of the class. The concepts that we focus on most have broader application than just the SAT. I teach the students to write a Thesis Support Essay and encourage analytical writing, and both of these skills will serve them well as they continue their educations. The class begins on Sept. 1, 2014, lasts four weeks, and ends in time to take the October SAT exam. However, many students find it beneficial to take the course several months before they take the SAT. While September 1st is a holiday, students who register a week before the class begins will get all of the assignments so they can do them ahead of time and take Labor Day off. Registration ends on Aug. 30, but if the class fills up it will end sooner. Some of you may have heard about the re-design of the College Board SAT exam, including making the essay optional-- however, those change will not take place until spring of 2016, and the essay will be required until then. Help your student be prepared! We hope this very helpful course will be a good fit for your high school student! In order to register, please arrive by 8:45am. The cost (which includes the buffet lunch and snacks) is $39.95 for the first person in the family and $34.95 for each additional person. This will be PHAA's (Pennsylvania Homeschoolers Accreditation Agency) nineteenth annual High School at Home Conference. It will take place on Friday, July 11, 2014, from 9AM to 5PM at the Hotel Carlisle (1700 Harrisburg Pike, Carlisle, PA 17015) on Route 11 just North of Turnpike and I81. There are sessions especially designed for parents, homeschooled students, and evaluators. New to High School Parents: Find out how the PHAA high school diploma works, lab science and foreign languages at home, and get tips on making the transition to high school from a panel of experienced homeschooling parents who’ve been there. Experienced Parents: Help your kids make the transition to college through college scholarships, preparing for the college interview, and writing the college application essay. Improve your program with new ideas for AP courses, honors courses, lab science and foreign language courses. Students: Find out about joining the Excelsior staff, volunteering to make a difference or starting a business that actually makes money. Look forward to college or employment with sessions about preparing for the college interview, military service or writing the college application essay. Evaluators: There will be sessions outlining how to award credits for the PHAA diploma and a chance for evaluators to discuss the tricky situations that they have encountered. Many sessions will help you to be a better guidance counselor for your evaluees. A great amendment was added to HB 1013 today! I am very pleased that Pennsylvania House Bill 1013, a bill that improves the PA Home Education Law, was amended on the House Floor today in a way which should please all homeschoolers. Supervisor-issued diplomas (also signed by the evaluator) will be recognized by law, and there is also specific language putting into law that homeschool associations recognized by the PA Department of Education can also issue diplomas. HB 1013 has now been referred to the Appropriations Committee and will likely pass at the end of this month as part of the grand budget compromise between the Republicans in the House, the Republicans in the Senate and the Corbett administration. Here's what happened today. First, Representative Mark Longietti proposed the amendment that we had asked him to propose, but it was narrowly defeated. The vote was 99 in favor and 103 against. Nine Republican representatives voted for Longietti’s amendment, even though Longietti is a Democrat. Then Representative James R. Roebuck, the ranking Democrat on the House Education Committee, proposed two amendments to the bill. They were both defeated because Republicans, almost unanimously, voted against them. Pennsylvania's House Bill 1013 would add a fourth option, a parent-issued diploma that is also signed by the home education program evaluator. Our organization favors this new provision, but when we read HB 1013 carefully, we became very concerned. While adding the parent-issued diploma, the bill may have inadvertently taken away recognition from the home education association diploma. In order to understand this unintended consequence, it is necessary to understand the history and recognition of the home education association diploma option. (1) Four years of English. (2) Three years of mathematics. (3) Three years of science. (4) Three years of social studies. (5) Two years of arts and humanities. At the 11th hour, just before passage in the House, the Appropriations Committee, at the request of Governor Casey’s Department of Education, removed Section D from the bill. That was when we realized that when a law specifies graduation requirements, it implies that there is a diploma. HB 1013, a bill that passed the PA House Education Committee on June 4, specifies that parents and the senior year evaluators give the diplomas that are provided for in the PA Home Education Law. When I read it, I realized that it left out the ten home education associations that are currently recognized by Pennsylvania Department of Education (PDE) policy to issue those diplomas. I concluded that it could end recognition of the organization I direct, Pennsylvania Homeschoolers Accreditation Agency (PHAA). I was wrong! Although HB 1013 threatens the right of PHAA to issue recognized diplomas, it does not threaten PHAA’s right to accredit home education diplomas. In the unlikely event that HB 1013 were to pass without change, the parent and evaluator could sign the parent-issued diploma and PHAA would add its recognized seal of accreditation. Would HB 1013 affect Home Education Association Diplomas? On June 4, House Bill 1013 passed the House Education Committee. In many ways it is a good bill. It continues the important role of the homeschool evaluator in homeschooled students' lives. It would greatly reduce the hassle of complying with the homeschool law. It also provides for a recognized parent-issued diploma (also signed by the evaluator) that is entitled to all of the rights and privileges of a normal high school diploma. But when I read the bill carefully, I became very concerned. While adding the parent-issued diploma to the law, the Representatives in the House Education Committee may have taken out recognition for the home education association diploma. As founder and Executive Director of Pennsylvania Homeschoolers Accreditation Agency (PHAA), one of those diploma granting associations, I was concerned about the possible harm to our current students as well as to those who would have wanted our diploma in the future. The more that I heard from Representatives and from the proponents of the bill, the more I realized that it was not their intention to take away recognition from the home education association diploma. See, for example, the latest posting on the CHAP website (HB 1013 will not change homeschoolers’ choice to receive a diploma from a diploma program). Although I disagree with the conclusion of this article, I was pleased that it was not the intention of CHAP to take away recognition from our diploma. Entrepreneurship happens naturally when you homeschool-- at least in my family! .... And a job opportunity for homeschool teens at the 'Twirly Top' ice cream shop! Editor's Note from Susan Richman: We've known Sarah Keckler and her family ever since the first full year of the PA Homeschool law-- and I was delighted to receive an email recently from Sarah wondering about finding a way to let homeschool teens know about flexible summer job opportunities at her 1950's-style ice cream stand, the Twirly Top, located between Carlisle and Gettysburg PA. I encouraged her to write up a full article about how she found her way to becoming a business owner and entrepreneur-- and I know you'll be delighted with all that Sarah shares here-- very inspiring (and funny!) for sure! Soooo, hoping some of you know homeschool teens eager for a great summer job where they can really develop both skills and character... AND hoping many of you opt to visit the Twirly Top and the surrounding area (the link above has links to local sites to see!). We're also hoping that Sarah just might be able to take part in the special panel presentation on entrepreneurship at this summer's PHAA Homeschool Conference, on Friday July 11th -- she'll be a terrific motivational speaker! And even if she's not able to make it (she may need to be managing the Twirly Top! ), we're definitely giving out this article as a hand-out to all attendees ;-). Enjoy! And by the way... my husband says that Sarah was *star* student in his AP Macro-Economics online class when she was a high school homeschooler! When I was a child, the question “What do you want to be when you grow up?” seemed like a joke. I don’t recall anyone in my family ever taking this question very seriously and I followed suit with answers ranging in career path from the unlikely (racehorse jockey) to the non-existent (professional tree-climber) to the relatively unemployable (flying trapeze artist). Into my high school years, these responses became less acceptable so I picked a generic “something in business” reply with absolutely no idea what that might mean- I certainly did not expect it to entail owning and operating an ice cream shop! My journey from a shy homeschooled child to a 25-year-old business owner has been nothing short of eventful and I hope this article will provide insights and inspiration for homeschool students and educators alike. To be honest, I never really saw an up-close example of a ‘traditional’ 9 to 5 office job. My childhood was full of entrepreneurial pursuits, although I did not recognize any of them as such at the time. My dad was a truck driver and caretaker of our large backyard garden plot and my mom was the homeschool instructor for myself and all 6 of my siblings. In her spare time (tongue-in-cheek) she taught piano lessons, did homeschool evaluations, made and sold quilts, and ran our little farmette. During my teen years, my mom expanded her scope by obtaining a bakery license for our kitchen and selling baked goods to nearby restaurants, neighbors, and eventually farmers markets. Even my grandparents exemplified non-traditional “jobs” post-retirement. My artist/inventor/mechanical genius grandfather with a passion for trains and old cars created highly-detailed pencil drawings of classic antique cars, train engines, and Harley-Davidsons. He framed and sold the drawings at craft shows alongside my grandmother’s exquisite crocheted lace tablecloths, starched Christmas decorations, and homemade fudge. On March 4, Homeland Security reversed course. After spending years reversing the asylum that had been granted by an immigration judge to a German Homeschooling family, they suddenly decided to let that family stay in the U.S. where they can homeschool legally. Jeannette Webb is the founder of Aiming Higher Consultants, a high school planning and college consulting firm dedicated to helping homeschooled students reach their potential and successfully apply to their dream colleges. Learn more at aiminghigherconsultants.com -- and check out her regular blog articles there, as they are VERY uplifting and worthwhile! The spring semester means different things depending on where your student is in the high school progression. Freshmen are still exploring activities and learning to hold their own in difficult high school classes. Sophomores are rolling along in their AP class(es) and settling into their extracurricular focus. Seniors are breathing easier after completing the college application marathon and just need to keep their record strong while waiting on college acceptance decisions. It is the juniors who are getting ready to enter the gauntlet. Testing - Research confirms that the spring of the junior year is the time that kids will produce their strongest scores in the SAT and the ACT with writing. Not only do they need to be preparing for one of those tests (and in most cases I recommend only taking one, the SAT or the ACT), they ideally need to be wrapping up their 2-3 SAT subject tests by June if they plan on applying to selective schools. Certainly, many schools do not require the additional testing load, but you need to have determined whether or not your student needs SAT Subject Tests by early in the Junior year and plan accordingly. Activities - Students by this point need to have focused on a meaningful extracurricular or co-curricular activity that has brought depth to their life and to their profile. Paperwork - By the junior spring, homeschooling parents should have started to put together the school documents (resume, transcript, transcript legend, and school profile) that will be needed when the student starts filling out college applications midsummer. That’s right. Midsummer. Many college applications will be up and available sometime in June or early August. The wise family will start to tackle these immediately and have them ready to go before the school load heats up in late fall. Register by Friday Jan 31st!!! SAT Essay Preparation month-long course now open for registration! Seeing all the announcements of 'Black Friday' sales coming up, we've decided to put some items on special sales for the next MONTH. Check out our online store (just click on each title!) for full details. Might make fun gifts for your kids! 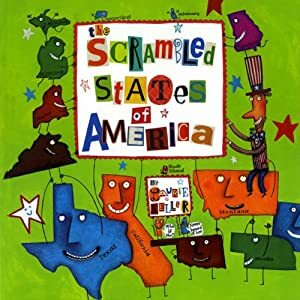 The Scrambled States of America (hardback book), by Laurie Keller. This book is a *favorite* of most kids who see it-- from preschoolers through late elementary years. Our 9-year-old grand-daughter from VA was reading it aloud to our 2-year-old grand-daughter from Israel when they were all together here at our farm in Western PA this October-- and the little one was enthralled!! Very humorous-- and makes learning about the states and where they are located light-hearted and engaging. Delightful and whimsical illustrations! Regular price $9.95, now just $4.98 on sale -- limited supply!!! SET: The Family Game of Visual Perception. This terrific and fast-paced game has won over 25 'Best Game' awards! Our kids LOVED this growing up-- and we were introduced to it by another homeschooling family, of course! Takes creative analytical thinking-- one year our son Jacob attended a special summer math enrichment college program, and his special team project there was to analyze this game! Most kids get MUCH faster than their parents surprisingly quickly! Can be played solo or in a group of any size. A great game for a range of ages! Was $11.95 on close-out sale... NOW just $5.98 while supplies last!!!! Just the right size to fit in a stocking, or to give as a little gift on a night of Hanukkah, too! Hope you find something fun for the children on your 'list' this year!! Check out the other 'close-out' items in our Online Store (link above), too!! Hope you all have a very happy holiday season! Editor's Note from Susan Richman-- In past years many homeschoolers have taken part in this annual poster contest that helps students investigate the problems of underage drinking. This can be a valuable part of an overall health program -- not to mention a great art lesson! The website for the program includes images of past winning posters, to help students get a feel for the level of quality hoped for in the contest. I especially like that the contest is encouraging students to come up with positive images of the many wonderful alternatives to using alcohol, rather than focusing on negative images. Here's also one (of many!) possible websites that has helpful information for parents about starting the conversation about alcohol use -- and this poster contest can be one vehicle to do so. This link to PLCB resources can also be helpful-- many are PDF information sheets you can print out at home. Hope your student takes part-- and that we have some homeschool winners once again this year! With a little under a month remaining until the deadline, the Bureau of Alcohol Education wants to remind you that we are still accepting submissions for the Alcohol Awareness Poster Contest. This contest is open to all Pennsylvania students in kindergarten through 12th grade, including those who are home-schooled. PHAA Graduate Ruthie Snoke publishes first novel! Editor's Note from Susan Richman: I was delighted to receive the following email from PHAA graduate Ruthie Snoke, sharing about her new novel that's just been published. My own girls knew the Snoke family well through their time together on a homeschool volleyball team, and it's just always great to hear about the unique endeavors of homeschool alumni! I'm always amazed at the initiative homeschoolers are taking in forging ahead in their lives, truly working to use their gifts to help others and spread the learning that was so valuable to them growing up. Ruthie also has an excellent website, where she shares not only about her new book, but about her acting classes, poetry writing, and more. Ruthie is a graduate from Wheaton College (2011), with a major in English and a minor in theater, and has just started a graduate program in NYC. The book is a novel told in first person, and it's from the perspective of a girl named Ede, who lives in a medieval-type world. I created the world myself, but based it heavily on a blend of different cultures from our own world, so it's a unique blend of fantasy that feels like historical fiction, somewhat in the style of Ursula LeGuin. The book deals with themes of growing up, hurt, forgiveness and change, and I would recommend it for high schoolers. It has themes such as adultery in it, and though it is in no way explicit, there are some parts that parents may want to make sure their student is ready for.